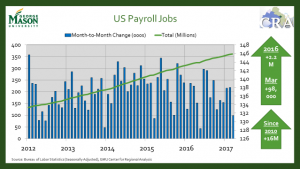 National employment situation numbers released this morning show payroll employment increasing by only 98,000 and the unemployment rate decreasing 0.2 percentage points to 4.5 percent. The professional and business services sector saw the largest growth at an additional 56,000 jobs and for the second straight month, retail trade lost nearly 30,000. 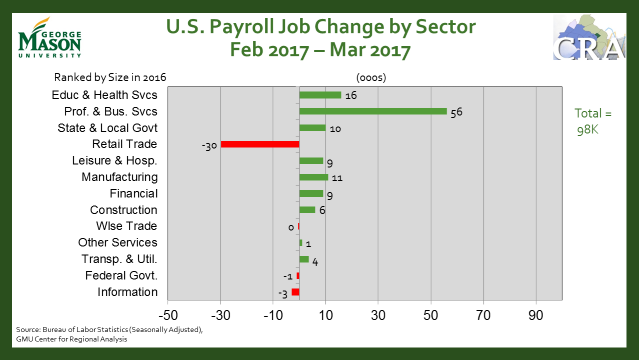 Total employment is up 2.18 million from March 2016. 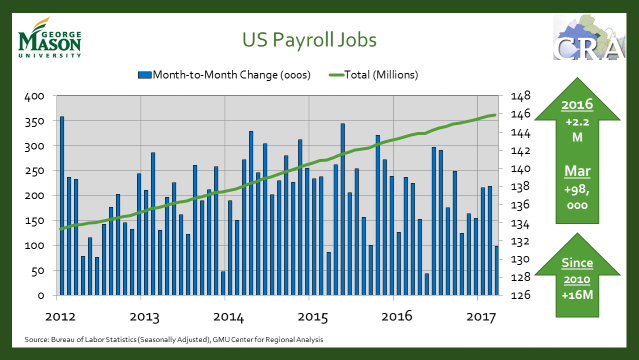 The relatively small jobs growth could be due to large February jobs numbers, boosted by unseasonably good weather across the country, as well as the late snow storm in the upper midwest and northeast in March that possibly suppressed some seasonal hiring. Other measures of the economy remain strong, so a slowdown of one month is no cause for concern. The unemployment rate is now at its lowest point since May 2007 as the economy gets closer to full employment. 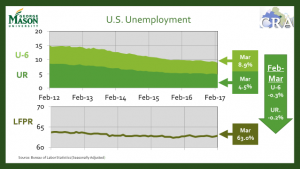 The better news lies in the U-6 unemployment rate decreasing 0.3 percentage points to 8.9 percent (includes marginally attached workers and those employed part-time for economic reasons). 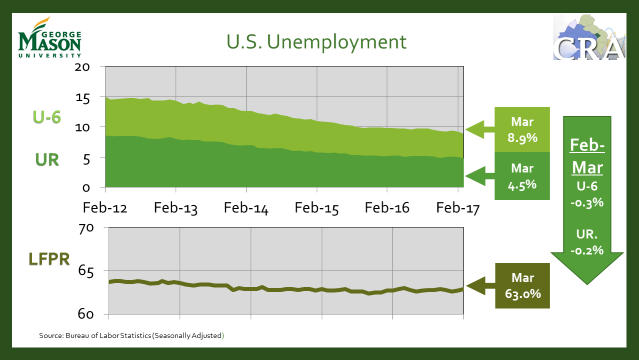 As the gap shrinks between the unemployment rate (U-3) and the U-6 rate we see the number of underemployed and discouraged workers decrease.